Chalet Hotel Breithorn in Champoluc is full of charm and is proving to be a popular choice with our guests. It is a lovely, traditional hotel which has been beautifully restored and modernised whilst respecting all its traditional Alpine features and character. The spacious lounge and reception area has a fireplace, wooden vaulted ceilings and comfortable furniture to make you feel at home as soon as you arrive. The Chalet Hotel is a perfect mix of traditional and modern to give the ideal atmosphere of a special mountain retreat and a base for the skiing trip. The hotel has been lovingly restored and all the traditional features retained thus keeping the unique character of the hotel and a clever combination of old and new. There is a spacious lounge with a small bar and reception area with an open flame fire, beautiful carved vaulted wooden ceilings and comfortable furniture on which to relax. The pictures on the wall add a distinguished air and traditional Alpine decorations will remind you that you are in the mountains. There are a total of 31 bedrooms which all differ in layout and decoration. No two rooms are alike except that they are all beautifully decorated with attractive wooden features and decorations. The beds are all twin/doubles so can be made in to twin or double beds and all have en suite facilities. All of the bedrooms have a TV and DVD player, safe and hairdryer. Most of the Large and Superior rooms have an extra bed for a child. On the 4th floor are larger superior rooms which have mountain views and either shower or hydromassage bath. There is also a Junior Suite on the 4th floor with a lounge and separate bedroom. We update Chalet Hotel Breithorn's details often, but facilities do change. e.g. some extras listed by the supplier as "free" or included might only be for the first time you use them, or for one time per party, then charged for further use. If any specific feature is essential to your holiday, make sure you ask us to confirm the details of it before you book your holiday. This package holiday to Chalet Hotel Breithorn in Champoluc, Italy departs Saturday 28th December 2019, for a 7 night stay on a "catered chalet" board basis. A local tourist tax (Taxe de Sejour or Kurtaxe) is levied by many councils in European ski resorts. It varies by standard and type of accommodation and is age dependent, so not everyone is charged. It's not included in the basic price of your holiday and is usually paid locally. For reference, the average charged in winter 15/16 was between 50p and £2 per person, per night. Champoluc is a quiet, authentic Italian mountain town with jaw dropping sights of the Italian, French and Swiss Alps including giants like Mont Blanc and the Matterhorn. Top this off with access to 180km of piste in Italy’s answer to the 3 valleys and ski holidays here should be a week to remember. Champoluc lift pass price last reported as 210Euro for the whole Monterosa region (adult 6 day). Ask for a quote when booking Chalet Hotel Breithorn. Champoluc has W SW E SE facing slopes. Usually open for skiing Dec-May. 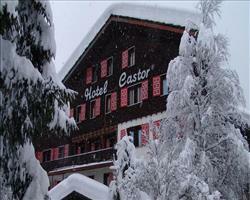 Hotel Castor Champoluc Italy, Gatwick to Turin 28th December. Hotel Relais Des ... Champoluc Italy, Gatwick to Turin 28th December. We really like the accommodation. It was generally pretty good, although the food could’ve been better. The rooms were a good size (we booked some of the larger rooms). The location was good, only a short walk to the lifts. The ski lockers by the lifts were very handy! We didn’t have to lug our skis around every day which was great. As always with this company the staff were brilliant and we were well looked after. The hotel itself is fine. You can walk down to the lifts/slopes and leave your skis and boots in a locker by the lift. We had a bit of a problem on the first night when there was an enormous party staying there, and the rest of the guests who weren’t in the party were thrown into the annexe. We sorted it with the manager and by the end of the week everyone was getting on really well.